Ross-on-Wye 5 miles, Monmouth 7 miles, Hereford 14.5 miles, Chepstow 23 miles, Newport 31 miles, Cardiff 43 miles, Bristol 38 miles Railway Stations: Hereford 13.5 miles, Newport 31.5 miles (London Fast Train) International Airports: Cardiff International Airport 58 miles, Bristol 55 miles, Birmingham 74 miles Education There is an excellent range of both public and private schools in the locality including Hereford Catherdral School, Haberdashers Schools at Monmouth and Howells at Cardiff, along with a good range of local State schools. For independents see www.isc.co.uk and for state school information see: www.mylocalschool.wales.gov.uk. 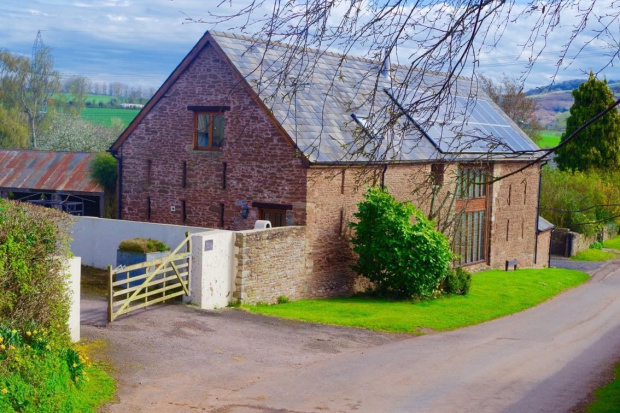 Local, Sporting & Recreational Marstow is a small hamlet situated in the South corner of Herefordshire, within striking distance of the Welsh Borders. 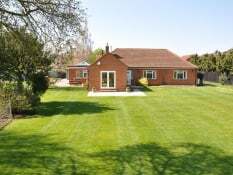 The neighbouring village of Goodrich offers Post Office, Shop, Primary School, Public House and Church. More shopping, sporting, cultural and education facilities can be found in Monmouth, Hereford, Newport and Cardiff. 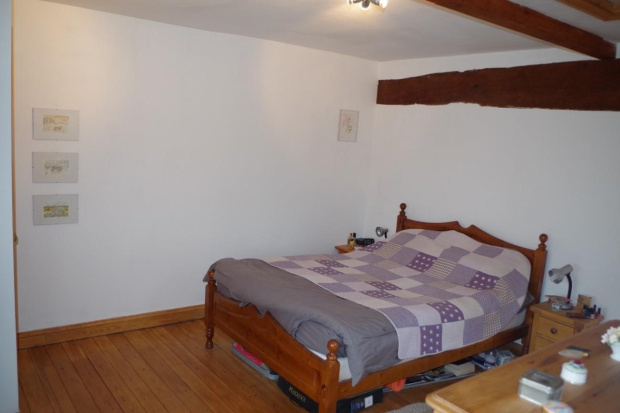 Good walking and cycling opportunities abound from the property with good outriding. Golf can be enjoyed at Hereford, Monmouth (Rolls), Ross-on-Wye and Newport (Celtic Manor). 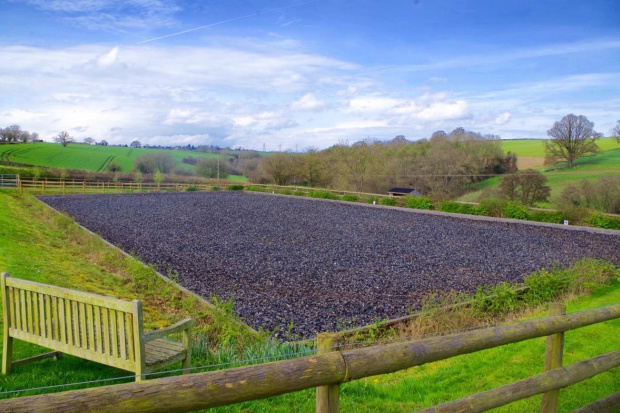 The region is renowned for its strong equestrian industry and the property benefits from excellent out riding. Kings Equestrian Centre (30 miles), Hartpury College (20 miles) and David Broome Centre (23 miles) all play host to a series of year round competitions. Cross-country courses are at Bredenbury and Sapey. Racing at Cheltenham, Chepstow, Ludlow and Worcester. Local hunts include South Herefordshire Hunt, Monmouthshire Hunt and Ross Harriers Hunt. 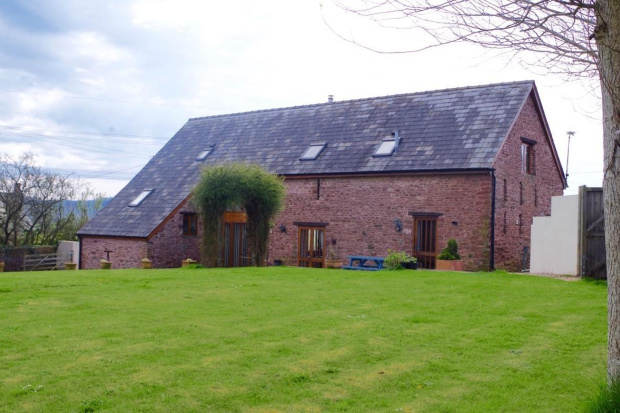 The Grange is a spacious detached barn conversion dating back to the early 1800s. 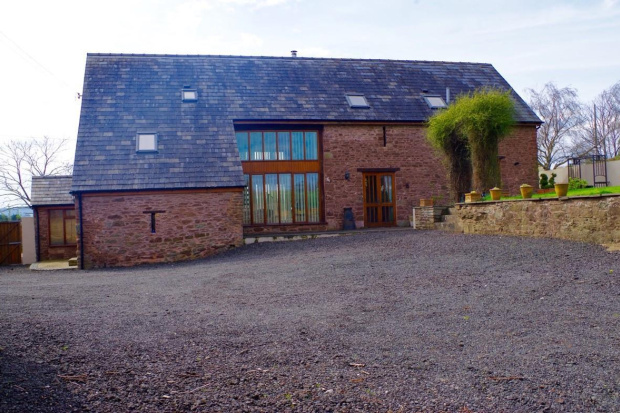 The barn was converted in 2003 to a very high standard by the current owners and has far reaching views over its own gardens, pastureland and open countryside. The property benefits from double height windows letting in an abundance of natural light. 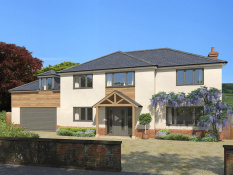 The majority of the ground floor is open plan offering a large family area ideal for modern day living. 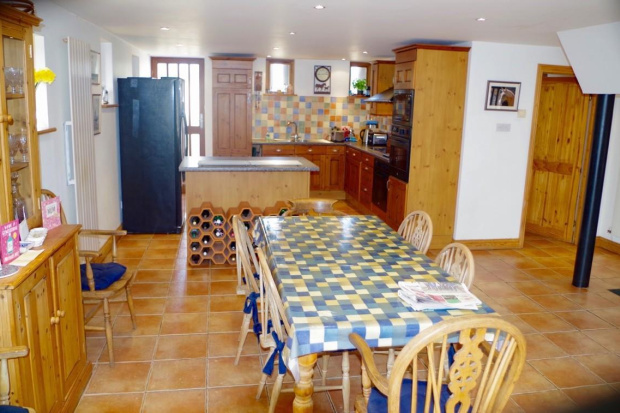 The fully equipped kitchen and dining area, with steps leading down into the spacious sitting area. A focal point of the area is the Rocal wood burning stove. Doorways leading off to the reception hall, cloakroom and study. 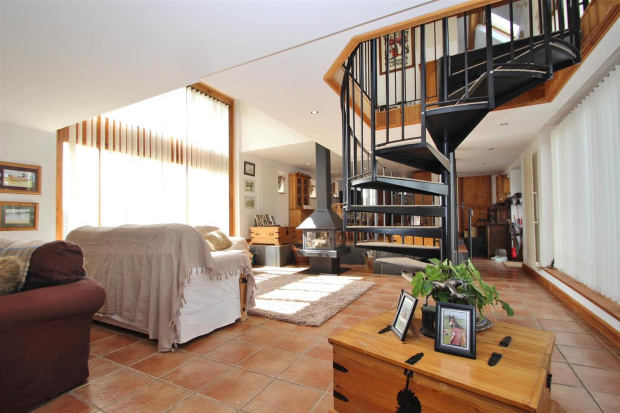 From the living area a spiral staircase leads to the contemporary styled galleried landing with wrought iron and glass ballastrading. Vaulted ceiling, exposed beams and atmospheric lighting. On the first floor there is a master bedroom with en suite shower and 3 further bedrooms with pine flooring throughout and family bathroom. 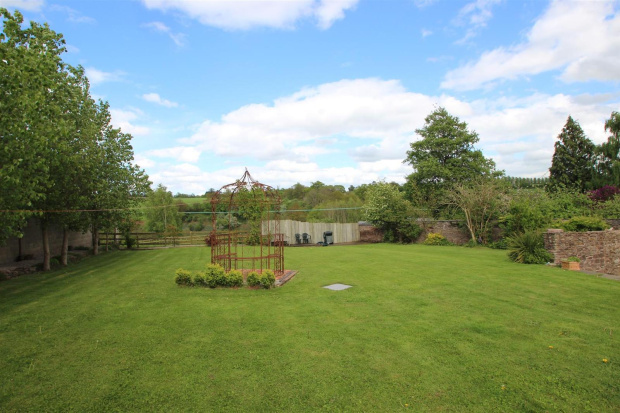 Set in grounds of approximately 16 acres, the property benefits from excellent equestrian facilities with stabling and pasture, suitable for equine or smallholding, making it an ideal property for anybody wishing to enjoy a rural family life. 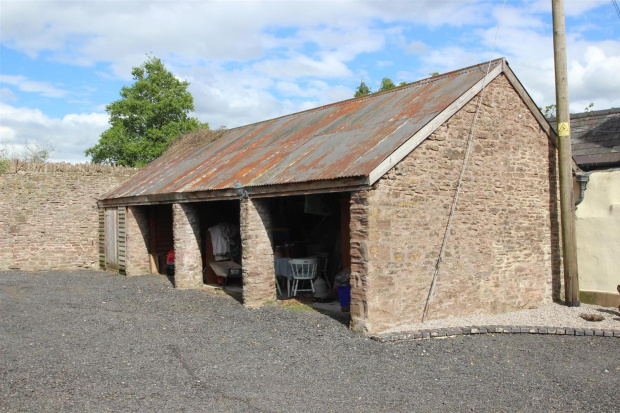 Directly opposite the main residence is the original Cart House currently used for cars, but offering potential subject to planning for accommodation for a dependant relative, staff or holiday let. Approached off a village road the property offers a private rural country residence, with gravel parking area to the front of the property. There is ample parking for a number of cars within the Courtyard setting. Decking areas and lovely seating areas adjacent to the main barn are ideal for Al Fresco dining. A gate leads through to the stable yard, which benefits from a separate entrance off the road. 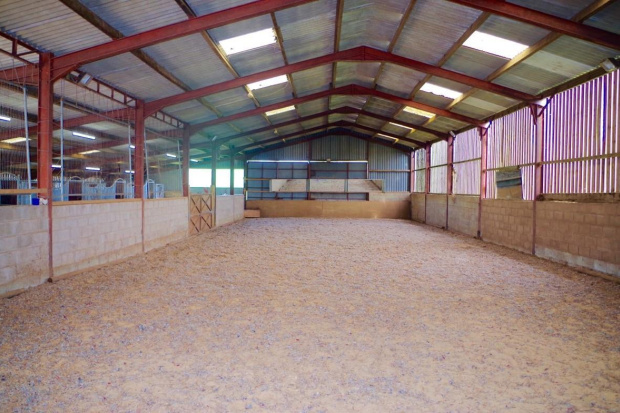 There is a modern farm building with 6 American stables and tack room with feed area, along with the indoor school 30m x 10m approx. Making this ideal for handling and breaking in young horses. 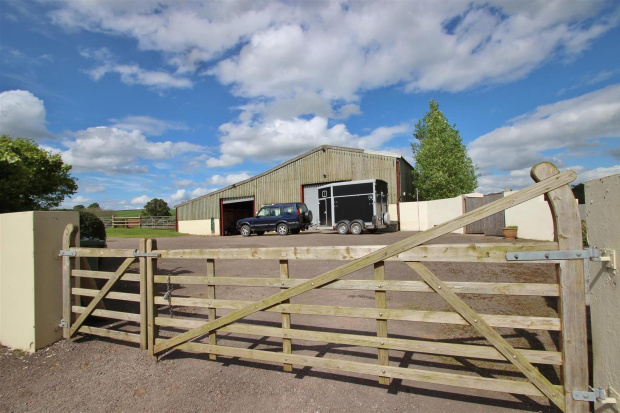 To the outside there is a 20m x 40m outdoor arena with further concrete area ideal for more stabling (subject to planning) with ample parking for lorries and trailers. The land around the American Barn is divided into post and rail paddocks. 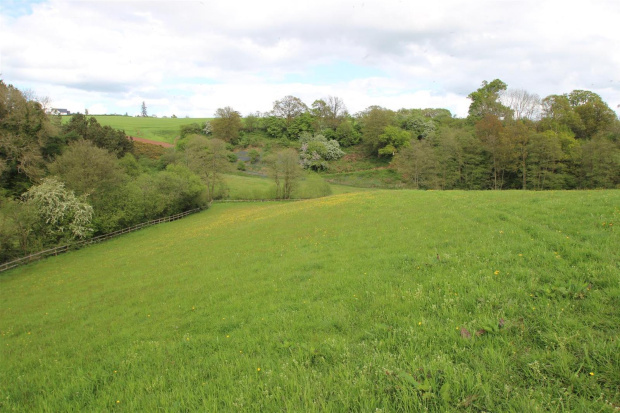 The remainder of the land sweeps off down the valley to the Luke Brook and a mature woodland. Property Misdescriptions Act 1991. Fox Grant and their clients give notice that: 1. They have no authority to make or give any representations or warranties in relation to the property. 2. These particulars have been prepared in good faith to give a fair overall view of the property, do not form any part of an offer or contract and must not be relied upon as statements or representations of fact. 3. Any areas, measurements or distances are approximate. The text, photographs and OS plans are for guidance only and are not necessarily comprehensive. It should not be assumed that the property has all necessary planning, building regulation or other consents. Services have not been tested. Purchasers must satisfy themselves by inspection or otherwise. Mains electricity supplement by Solar Panel Photovoltaic System, mains water with septic tank drainage and oil fire central heating.